A new weight loss study conducted by Ben-Gurion University of the Negev (BGU) researchers reveals that dieters who consumed milk or milk products lost more weight on average than those who consumed little to no milk products. Regardless of diet, researchers also found participants with the highest dairy calcium intake, equal to 12 oz. 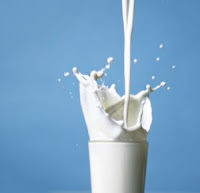 of milk or other dairy products (580 mg of dairy calcium), lost about 12 pounds (6 kg.) at the end of the two years. In comparison, those with the lowest dairy calcium intake averaging about 150 mg dairy calcium, or about half of a glass, only lost seven pounds on average. The study was published in the current issue of the American Journal of Clinical Nutrition. Beyond calcium, the researchers also found that blood levels of vitamin D independently affected weight loss success. Vitamin D levels increased among those who lost more weight. The dietary intervention study also confirmed other research that overweight participants have lower blood levels of vitamin D.
More than 300 overweight men and women, aged 40 to 65, participated in the study evaluating low fat, Mediterranean or low-carb diets for two years. Dr. Danit Shahar, of BGU’s S. Daniel Abraham Center for Health and Nutrition and the Faculty of Health Sciences, led the study. It was part of the Dietary Intervention Randomized Control Trial (DIRECT) conducted at the Nuclear Research Center in Israel. According to Dr. Shahar, "It was known that over-weight people had lower levels of serum vitamin D but this is the first study that actually shows that serum Vitamin D increased among people who lost weight. This result lasted throughout the two years that the study was conducted, regardless of whether they were on a low-carb, low fat or Mediterranean diet." Vitamin D increases calcium absorption in the bloodstream and in addition to sun exposure can be obtained from fortified milk, fatty fish and eggs. Americans generally consume less than the recommended daily requirement of Vitamin D which is found in four glasses of milk (400 international units). The study was supported by the Israel Ministry of Health and the Israel Dairy Council, the Israel Chief Scientist Office, German Research Foundation and the Dr. Robert C. and Veronica Atkins Research Foundation. Dairy Calcium Intake, Serum Vitamin D, and Successful Weight Loss. American Journal of Clinical Nutrition. 2010. Published ahead of print. Shahar DR, Schwarzfuchs D, Fraser D, Vardi H, Thiery J, Fiedler GM, Blüher M, Stumvoll M, Stampfer MJ, Shai I.